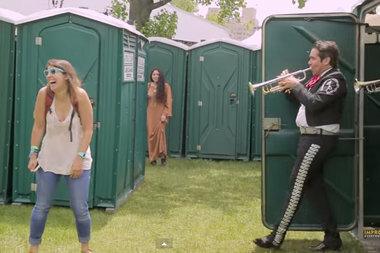 Some restroom-goers at this year's Governors Ball got quite a shock, when instead of a stinky yet peaceful moment to themselves, they were bombarded by a full-on marching band, a gospel choir, or a Mariachi band flooding out from the portable toilette. Improv Everywhere, the group that staged the elaborate heist, posted a video on Tuesday of the entire prank. While the front of the toilet looked like a regular porta-potty, the back had been removed allowing dozens of people to stream out with instruments and elaborate costumes. You can visit their website for more info about the prank.